Scottsdale is one of the best and most fun cities of central Arizona. Here you can find culture, style, history, shopping and fine dining venues and so much more. With its great school districts Scottsdale also makes an excellent place for families to settle down. Whatever you may be in to, from playing golf, to hiking, swimming, running, exploring the desert, you can do it here. While your house might be stylish and sleek, your garage is probably not. Garage spaces often start out as good intentions and as time goes by, they turn into overflow storage spaces or areas where you drop your equipment when you come home from biking the Arizona mountains or playing one of many fantastic golf courses. Scottsdale Garage Cabinets provided by the experts at Barefoot Surfaces, might just be the storage solution you are looking for. 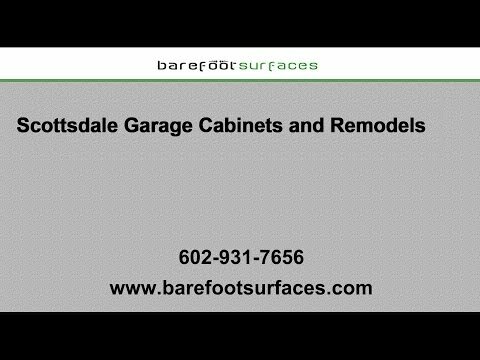 Ric Ramirez with Barefoot Surfaces has been providing top notch Scottsdale Garage Remodeling Services for years. His passion for creating functional and appealing storage spaces shows with every completed project. Our Scottsdale design team always strives to fulfill the clients’ visions by getting to know them and understanding what it is they need from their garage and their garage cabinets. If you are not sure what it is you are looking for, we are also available to talk over different options and give advice. After all, we want to give you the garage storage space with cabinets that work for you. Barefoot Surfaces is proud to offer only the best Scottsdale garage cabinets and is an authorized dealer of Slide-Lok products. Because we want you to be happy with your cabinets and garage storage space for years to come, we only work with the best and we believe in the quality and performance of Slide-Lok garage cabinets. From choosing the perfect cabinet model and type to the final install and set-up in your Scottsdale garage, Barefoot Surfaces got you covered. Because everybody has a different style you can choose your cabinets from the Classic or the Tech series and even add drawers or shelving. Reclaim your garage and ban the clutter. With the high quality plywood (never particle board) components from Slide-Lok, you can be sure that your garage storage can handle anything you throw at it. Bring style and function into your garage, free up floor space -maybe have your floors coated while you are at it-and admire your new garage. Our customizable Scottsdale Garage remodels put and end to clutter and searching through piles of assorted items for hours. Everything will have its place and be protected from moisture, unauthorized access, pests and more. Get a garage you can actually park your car in again. If you are interested in giving your garage the makeover it deserves, contact Barefoot Surfaces today. We have more than two decades of experience in the business and know how to create a garage that has functional and attractive storage space. Now that your floor is clear of clutter, is the perfect time to think about a Scottsdale concrete garage floor coating. We have great epoxy and polyaspartic floor coats that will make your concrete look great and last for years. To learn more about our Slide-Lok cabinets, garage remodels or concrete floor coating services, contact Ric per email at Ric@barefootsurfaces.com or call us at 602-931-7656.